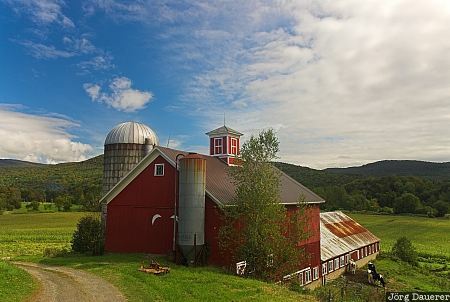 A typical red farm near Cambridge in northern Vermont in the east of the United States below a blue sky with some white clouds. This photo was taken in the afternoon of a sunny day in September of 2006. This photo was the image of the month in May of 2017. This photo was taken with a digital camera.